There are nine people in Start360's Senior Leadership Team. They include our CEO, five service managers, communications, finance and corporate services. A former nurse, Anne-Marie helped set up the charity back in 1993. Among her interests are zumba and part-time lecturing on preparing for empty nests! Cara ensures the smooth running of Start360, looking after HR, IT and facilities. A mother-of-two, Cara spends most of her free time ferrying them between out-of-school activities. .
Clare is manager for the AD:EPT drug and alcohol services. Outside of work, Clare is mum to a beautiful daughter and enjoys crochet and cross-stitch. Clare controls Start360’s purse strings, developing and implementing our financial control procedures. At weekends she enjoys watching Ulster play at Kingspan. 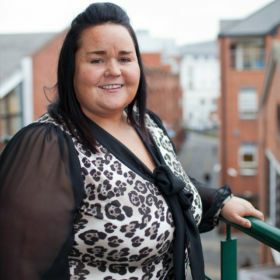 Kathleen looks after several services focussing on drug and alcohol programmes. Her claim to fame is she played camogie at county level for her beloved Antrim. Marie is responsible for drug and alcohol programmes in the East and West. Originally from Co Tyrone, Marie previously worked in London for 23 years. Ronan oversees a number of services relating to the welfare, rehabilitation and re-integration of young people involved with the criminal justice system. A father-of-three, he also has an active political life. Stephen specialises in a number of areas including employability, personal development and mental health. A keen sportsman, Stephen enjoys fitness training and is a long-suffering Liverpool fan. Zoë handles all of the organisation’s media, political and public relations, and fundraising. Outside work, her interests include motorsports, walking and birdwatching.